Those fellas who gripe that modern music lacks a true guitar hero like Jimi Hendrix, Eric Clapton, Jeff Beck and Stevie Ray Vaughan can harp no more. 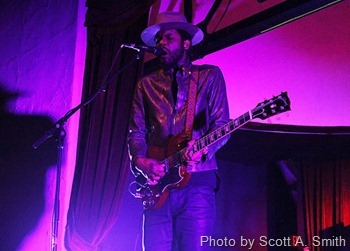 Grammy Award-winning guitarist/singer/songwriter Gary Clark Jr. has emerged from the Austin music scene and into the world’s spotlight as a promising, feisty hope for listeners who want their rock and blues loud, sweaty and real. The 32-year-old Clark continued his magical, winning musical streak in front of a packed, cheering house March 1 inside Tulsa’s historic Cain’s Ballroom. Touring to promote his latest long-player, “The Story of Sony Boy Slim,” the six-string maestro and his rhythm-perfect trio of backing musicians effortlessly transformed Cain’s shadowy interior into a hopping juke joint full of passionate performances. A mid-tempo stomper, “Bright Lights Big City” worked in summoning the audience members’ roar of approval. Five minutes later, Clark launched into the perky “Ain’t Messin’ ‘Round,” the first song on Clark’s brilliant 2012 album, “Blak and Blu.” Sure, the studio version’s horn section was absent, but Clark and his group – bassist Johnny Bradley, guitarist King Zapata and drummer Johnny Radelat – didn’t care. 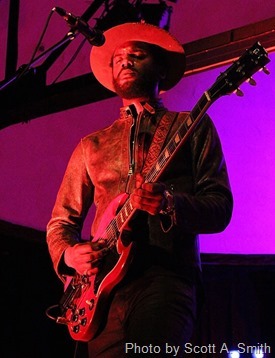 They let their instruments fill all the necessary sonic pockets at Cain’s, with Radelat’s thrashing drumming and Bradley’s groove-drenched, in-the-pocket bass work serving up a bullet-proof foundation for the lead guitar interplay between Clark and Zapata. With his bass slung nearly to his knees, Bradley stood to Radelat’s left, exhibiting a calming, Bill Wyman-esque cool as his appropriately fat bass notes rolled from the stage and frequently vibrated Cain’s wooden floor and the shoe soles of the concert-goers. Zapata and Radelat also were cool cats under the purple, red, green and yellow lights, playing with distinct skills but never overpowering Clark’s voice or guitar playing. The flowing set list featured the mini-jam fest, Hendrix-like “When My Train Pulls In,” as well as the genre-bending “Church,” “Travis County,” “Numb,” “Shake,” “Please Come Home” and “Grinder,” among others. Clark seamlessly bounced between hard rock, vintage blues, guitar-driven R&B, Americana and 1950s-style bee bop rhythms. At times, Clark’s soloing stood at a mid-level intensity, while at other times, when Clark would slowly saunter up to the middle, front area of the stage, his long, skinny fingers would work feverishly over his fret-board. A wonderful sense of rage a la Hendrix and a “Live at Leeds”-era Pete Townshend then would emit from Clark’s strings. Unable to be pigeonholed into just rock, blues, funk or hard soul, Clark is a guitar hero for today: He stands up there with rock’s greatest ax-men, and although he never mimics their guitar mastery, Clark isn’t afraid to step into those pioneers’ mind-frame. It’s a now-rare concept that allows for more musical expression and instrumental abilities than just the standard verse/chorus/verse/chorus/end rubber stamp found in too much of today’s songwriting. Go see Clark and his band in concert now. That’s not a request. It’s a hard, hard recommendation, and it’s one that you will thank me for as soon as Clark’s third song in the set is over.